The technique of creating mangrove habitat using dredged mud appears little used, contrary to the situation for saltmarshes. A welcome exception is the recent project at Port Point Lisas, Trinidad. In 1979, 500 ha of man groves were reclaimed for port development. In 2000, a 20 ha, shallow, mud bank was bunded, filled by dredge spoil and allowed to dewater and consolidate. The bund wall was removed and the mud flat was naturally recolo nized by mangrove seedlings from a nearby natural mangrove forest. Ten species of birds, including the endangered scarlet ibises, have colonized the new mud flat. There are, however, no published reports on the sustainability of the mangrove forests 3 months after removal of the bund wall; reestablishment of the forest may be slowed by the fact that no tidal drainage creek network was created. Particularly in Vietnam and Thailand, there are thriv ing, long term efforts to replant mangrove trees in former mangrove areas as well as in shallow, muddy areas along the coast. To minimize uprooting of the mangrove seed lings by waves, the seedlings are grown in a nursery and replanted on site when the trees are at least 0.5-1 m tall. The main drive is to protect the muddy coastline from coastal erosion caused by typhoons. A wave swell of period 5-8 s entering a 100 m wide planted forest of Kandelia candel trees, that were planted at 1 m intervals, is reduced by 20% for 5-6 year old trees, by 15% for 2-3 year old trees, and 5% for 0.5 year old trees. A 3 km long and 1.5 km wide (cross shore) forest has been planted in the Thai Binh province of Vietnam; 6 years after planting the trees a 1 m wave entering the forest is reduced to 0.05 m at the coast. Without the sheltering effect of the mangroves, the waves would arrive at the coast with a wave height of 0.75 m. The process controlling wave dissipation causes wave energy to be dissipated in small eddies at the scale of the vegetation (a few centimeters) as a result of wave induced, reversing flows around the vegetation. The success of the planted forest in former mangrove areas depends on reestablishing a tidal drainage pattern. Usually these areas have been diked and tidal flows are restricted. 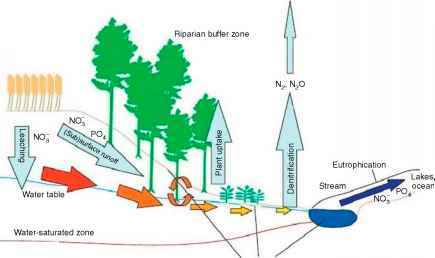 Too often foresters plant the seedlings but do not reestablish a tidal flow resembling the natural pattern. Where water stagnates, the seedlings invariably stop growing and they slowly rot and die. The seedlings are generally grown in nurseries and planted when 6 months to 1 year old. On occasions, local people have been recruited to scavenge mangrove seeds from surrounding beaches and creeks, and these are planted straightaway in degraded mangrove areas. Mixed success is achieved by this technique when plant ing in mangrove areas. One key factor is predation by crabs that destroy the developing bud and kill the seed ling. Mortality can reach 100% at some sites, though it is more commonly 70-80%. Thus, growing the seedlings initially in a nursery is often more efficient. Along tidal creeks near urban areas, a key problem preventing the establishment of planted mangrove seedlings is that they can be pushed over by floating debris and boat induced waves. A solution was found and is used in Florida waterways for instance, which however is expensive, as it requires equipment and man ual labor. Each mangrove seedling is protected with a thin tube wall of polyvinyl chloride. The pipe is partially split with a thin blade in order to maintain sediment levels inside the tube while the growth of the tree is not restricted, and the tube is sufficiently rigid to be driven into and anchor itself in the soft bottom sediments. The seedling grows twice as fast inside the tube than outside and is not removed by floating debris and boat induced waves. In logged but managed mangrove forests, such as the Konkoure River delta in Guinea, it is found that the trees will naturally reestablish themselves in the logged area provided that the bottom 1.3 m of the cut tree is left, allowing some regrowth, that several healthy trees are left in the logged area, and that the logged area is left ringed by a belt of healthy, untouched trees. The managed mangrove forests of Matang Malaysia are commercially logged. Selected areas, planned over a 20-30 year regrowth period, are stripped logged yearly, and seedlings of one species are replanted behind the loggers; as a result, a monoculture has resulted after 40 years of this practice and timber yield is decreasing. No technique has yet been developed to economically and successfully replant mangroves in shrimp ponds dug in mangrove soils. Coastal shrimp pond construction is responsible for the destruction of over 50% of the man groves in Thailand and the Philippines, yet it is unsustainable due to problems with acid soil leachate and contamination by viruses that usually result in a pond economic lifetime of 5-8 years. Further, the pond bed level is usually near low tide level, which effectively would mean that planted seedlings would immediately drown if the tide was allowed to flood the area. The soil needs to be entirely rebuilt to fill the hole and prevent acid leachate from exposed mangrove soils. Remediation is technologically feasible but economically too expensive for widespread use. No technique has yet been developed and proven to successfully replant mangroves over oiled areas. This is because the oil has infiltrated the ground through crab holes, and it can persist there for 10-20 years.